I’m appalled constantly at the misinformation we nutrition experts are telling folks with diabetes. It’s all over the place. The “everything in moderation” mantra, and how we need to eat less meat, less fat, and more whole grains, is a pervasive theme drilled into young dietitians, and spread to the public through our dietary guidelines. This information is making people sick. Last week, the following ad popped up in my Facebook newsfeed several times for “10 Foods That Are Great For Diabetics“. (This click bait article is also making the rounds on several other sites.) Here are the foods: dates, berries, garlic, flax seeds, apples, broccoli, oats, melons, kale and barley. Now, I don’t think that kale is BAD, but this list is like telling alcoholics to drink a little more orange juice or sprinkle some chia seeds into their martini and omitting the fact that they need to stop drinking booze. In our quest to avoid the truth and focus on individual super foods that will save us, this post is telling diabetics that dates are so amazing because 7 of them provide 4g of fiber. They forgot to mention that 7 dates equals 126g of carbs with no fat, so that’s pretty much like a syringe of sugar shot directly into your blood if eaten on an empty stomach. None of these top 10 lists had protein, and the only fat was flax seeds (for their omega-3’s) but what about fatty fish or fish oil, which is much more bioavailable? Why aren’t we instead telling them to avoid excess carbohydrates, because the last time I checked, you can actually reduce blood sugar by… not eating sugar! I’ve been on a protein and meat vindication kick lately, looking into how much protein we need, how much we’re eating, and what the best sources are. For this post, I decided to switch gears and look at the recommendations for carbohydrate intake to see where they came from and if it matches what we’re telling people to eat. How Many Carbs Do We Really Need? The macronutrient recommendations are based on this book published by the Institutes of Medicine. I reviewed the recommendations for protein intake in this post, where I illustrate that the science justifying the RDA for protein is pretty poor. The evidence is even worse when looking at the carbohydrate recommendations. They base the carbohydrate requirement of 87g-112 grams per day on the amount of glucose needed to avoid ketosis. They arrived at the number 100g/day to be “the amount sufficient to fuel the central nervous system without having to rely on a partial replacement of glucose by ketoacid,” and then they later say that “it should be recognized that the brain can still receive enough glucose from the metabolism of the glycerol component of fat and from the gluconeogenic amino acids in protein when a very low carbohydrate diet is consumed.” (Meaning, ketosis is NO BIG DEAL. In fact, it’s actually a good thing and is not the same as diabetic ketoacidosis that type 1 diabetics and insulin dependent type 2 diabetics can get.) The RDA of 130g/day was computed by using a CV of 15% based on the variation in brain glucose utilization and doubling it, therefore the the RDA (recommended daily allowance) for carbohydrate is 130% of the EAR (estimated average requirement). What are the Dangers of Overeating Carbohydrates? On the DRI (dietary reference intake) guide for carbohydrate intake, the column for “Adverse effects of excessive consumption” states “no defined intake level at which potential adverse effects of total digestible carbohydrate was identified.” WHAT? It also happens to say that the maximal intake of added sugars be limited to providing no more than 25 percent of energy. That’s 125 grams of carbs from sugar on a 2,000 diet. To give some perspective, one 12oz can of coke has 39g of sugar. This means they’re saying for someone eating 2,000 calories, it’s ok to drink more than 3 Cokes a day, (plus other carbs) as long as you eat less meat, less fat, and of course, more whole grains. Is that really what we should be telling people? According to the Institutes of Medicine, “Published reports disagree about whether a direct link exists between the trend toward increased intakes of sugar and increased rates of obesity… it appears that the effects of increased intakes of total sugars on energy intake are mixed, and the increased intake of added sugars are most often associated with increased energy intake. There is no clear and consistent association between increased intake of added sugars and BMI. Therefore, the above data cannot be used to set a UL (upper limit) for either added or total sugars.” WHAT?!? I’m not kidding, this is exactly what it says. The authors also go on to say there’s no risk of diabetes from consuming increased amounts of sugars, and they cite this study, saying that it showed that the more sugar one ate, the lower the risk of diabetes. I looked up the paper, and the authors did say that the more sucrose someone ate, the lower the risk of diabetes, but they also said that glucose and fructose intakes were positively associated with diabetes risk. Last time I checked glucose + fructose = sucrose. How does this make sense? The researchers also found significant discrepancies between self-reported diabetes and actual diagnosed rates of the disease (only 64% of those saying they had diabetes actually were diagnosed) and of course we all know that people love to lie on food frequency questionnaires. Is this really the research we’re relying on to form public nutrition guidelines? Of course there’s actually tons of evidence that increased carbohydrate increases type 2 diabetes, and that reducing sugar and carb intake reduces blood sugar. Pubmed lights up with evidence showing a low-carbohydrate diet is therapeutic in type-2 diabetes. So, How Many Carbs are We Telling Diabetics to Eat? If type 2 diabetes is a result of uncontrolled blood sugars, you would think that we should be telling folks to reduce their intake of sugar. Actually, the Clinical Practice Guidelines and Recommendations from the American College of Physicians lists “Oral Pharmacologic Treatment” as the official treatment, not diet counseling. With depression, for example, other non-pharmacologic methods like therapy and exercise are listed. When a type 2 diabetic does meet with a dietitian, we’re telling them to eat more than the RDA. Even though we have no actual need for carbs at all, and the RDA is 130g/day, the general guideline for adults with diabetes is 45 to 60 grams of carbohydrate per meal, and snacks having 15 to 30 grams of carbs. For the average adult eating 3 meals and 2 snacks a day (recommended) this equals a daily recommended intake of between 165g and 240g of carbs per day. If I started the day with this high carb, low protein and low fat breakfast, I’d be a wreck. In fact, before I started eating a lower carb diet, I actually was in metabolic syndrome. I’ve never been overweight, ate a mostly vegetarian, low fat diet full of whole grains like lentils, tofu, slathered in canola oil. I was doing everything right. At the time, if I went more than about 2 hours between eating I would start sweating, have tunnel vision, and was incredibly irritable. The word is “hangry.” I lived this way for over 30 years. When I do a nutrition talk, I always start by describing how I used to feel, and every time, more than half the room nods their heads signifying they too feel this way. Yet, we continue to tell people to eat this way. We nutrition experts are miserably failing at preventing and treating folks with diabetes. According to the CDC, 12.6% of Americans have diabetes, costing us $245 billion dollars in direct and indirect medical expenses. I’ve seen the incredible damage diabetes can do to people and it’s pretty ugly. It’s listed as the 7th leading cause of death, but because people don’t really die of “diabetes” but rather die of complications due to diabetes, like kidney failure and cardiovascular disease, the number is likely much higher. The rate is only increasing, especially in countries newly adopting our “heart-healthy” standard American diet. All over the world, people are giving up their healthy traditional diets and are drinking soda instead of water, using canola oil instead of traditional fats, and eating more refined junk foods – oh and it’s not only unhealthy but more expensive to eat this way too. Why can’t we tell folks who have diabetes the truth: that eating an “everything in moderation,” high carb, low fat and low protein diet will increase your chances of a completely preventable disease (in the case of type 2) that can lead to a very uncomfortable death? The American Diabetes Association lists beans as the ideal protein choice. Beans are one of the highest carbohydrate “protein choices” you can make. Should we really be telling them that beans, dates, oats and barley are superfoods, giving the impression that a few magical additions to their diet will fix them? As a dietitian with some sense, when I see a patient with blood sugar issues, I recommend a low-carb diet, adding more protein and healthy fats as the very first step. There are a handful of people who get it. In this literature review, researchers looked at 12 studies all showing the success of a low-carbohydrate diet had on reducing or eliminating the need for medication in type 2 diabetics. Answer: The real truth is that sugar, junk food and insulin sells. 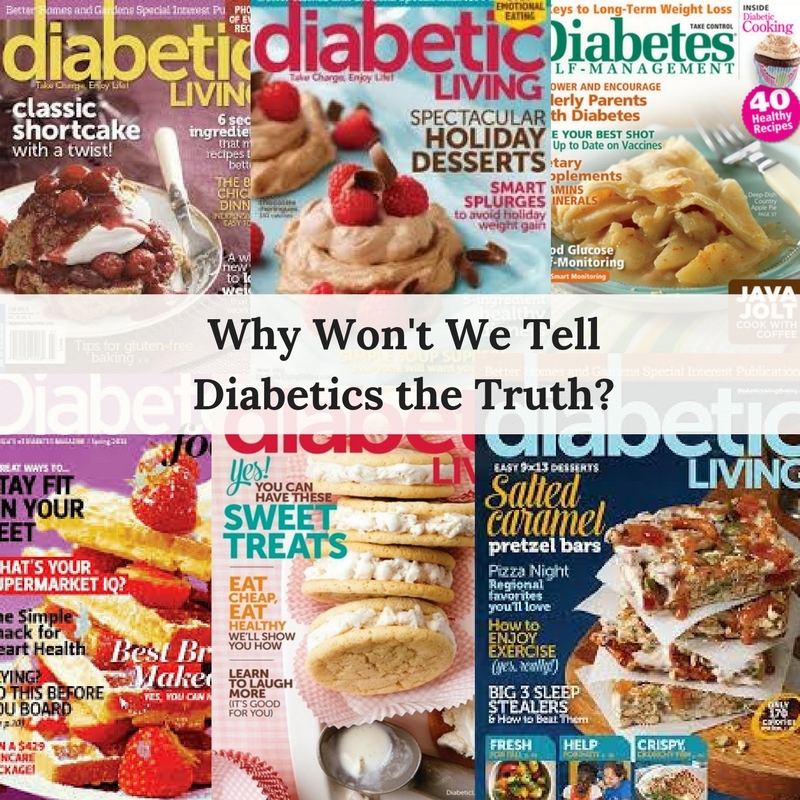 It’s time to admit that we’re failing diabetics. We can do better. They deserve the truth. Today we’re here with returning guest, our friend Mr. Tim Ferriss, to deconstruct the most transformative habits you can learn from the top-performers in the world. Lucki Gi– If you are not into Brazilian Jiu-jitsu we can still be friends, but c’mon, what are you waiting for? Jits is AWESOME! There are a lot of great Gi’s and rash guard options available these days and one of the best is Lucky Gi. From hemp to bamboo to more traditional fibers, Lucky Gi does a great job of keeping you protected and looking good while rolling.